Editors note: Stephen Rockwell Williams had just recently joined our Facebook Group Monster X Radio and shared with us his sighting of what he thinks may have been a cadborosaurus. 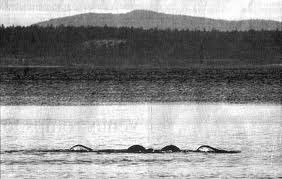 I believe I saw a cadborosaurus, back in 89, 90 on the ocean off the sunshine coast BC. I am a commercial fisherman and I was driving through a tide rip and saw what appeared to be 2 large tractor tire size inner-tubes pop up in line with each other about 30 feet [5 fathoms ] off my starboard bow. I was totally baffled by it for years because I new it wasn't dolphins or seals, but in around 94 I saw a show about cadborosaurus and learned there were many sightings near where I saw it , until then I had never heard of such a thing. So now I assume that's what I possibly saw.